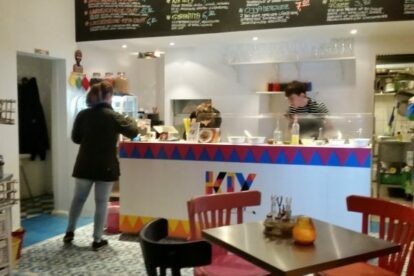 A block away from Savigny platz, KLX offers street food from the north of Africa and the Middle East. Despite they follow the original traditions of each place, they add their personal touch. The good thing about cosmopolitan cities is that you have the chance to experience bits and pieces from every country in the world, and this is a good example. The place is small, but colourful and cosy. The food is homemade, using self-made spice blends, fresh herbs and organic ingredients. If you go for lunch in a weekday better go after !3:30h to be able to find a table. It’s not an easy task to pick a dish from the menu, and unfortunately you can’t have them all in one take. I’ve tried the fatta hummus from Lebanon, the Kafteji from Tunisia, and the date-feta-walnut salad. But my favourite is the Garantita, a chickpea soufflé with homemade harissa paste and mixed vegetables with walnuts, dates, celery, and sheep feta cheese. Make sure you check what’s the weekly special. As for drinks, I recommend the lamoun bil nana, an Egyptian key lime lemonade with mint, or the rosenwasser-zitronenlimonade, Arab rose water with lemon and honey.